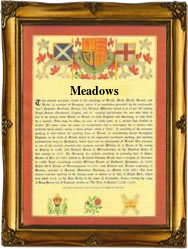 Recorded in the spellings of Meadows, Meddowes, and Medewes this interesting surname is English. It is a topographical name for someone who lived near grassland flooded in winter and used at other times for hay and pasture. The derivation of the name is from the pre 7th Century "maed", or Middle English "mede", a meadow. Topographical surnames were among the earliest created, since both natural and man-made features in the landscape provided easily recognisable distinguishing names in the small communities of the Middle Ages. Early examples of the surname recordings include: Henry del Mudue in the death duty tax charters known as "Inquisitiones post mortem" for the county of Derbyshire in1283, and Richard atte Medeue in the Subsidy Rolls of Sussex in 1327. Recordings of the surname from various registers include: the marriage of Agnes Meadows and William Crofte on July 28th 1618, at Leeds, Yorkshire; the marriage of Priscilla Meadows and Richard Guy on August 26th 1624, at St. Peter's church, Paul's Wharf, city of London; and the marriage of John Lyle and Barabara Medowe at St Dionis Backchurch, also city of London, on June 1st 1719. The first recorded spelling of the surname is shown to be that of Henry de la Medewe, which was dated 1280, in the charters of the county of Worcestershire. This was during the reign of King Edward 1st, known as "The Hammer of the Scots", 1272 - 1307. Throughout the centuries, surnames in every country have continued to "develop" often leading to astonishing variants of the original spelling.